There are a lot of reasons why to expect that if there is any interest rate hike this December, it will be only symbolical and it will probably take quite a lot of time before another hike will occur. There are various economists who have the same opinion and they don't see any good reason to increase the interest rate right now. One of them is Peter Schiff who expects that the Fed will leave the interest rate unchanged or it will raise it by 0.25%. He assumes that both of the outcomes will be positive for gold, as the markets have already factored in substantially more than a 0.25% interest rate growth. How did GLD share price react in the past? Although theory says that GLD price should decline after an interest rate hike and it should grow after an interest rate cut, history shows that this anticipation is often wrong. The financial markets always try to predict the future development, and the interest rate change is often reflected by the asset prices before the rate change itself is officially announced. And if there was a strong trend before the rate change, the trend may get disrupted for some time, although it tends to resume after the dust settles down. 22 interest changes occurred since the inception of GLD. In 12 cases, the interest rate was increased and in 10 cases it was decreased. 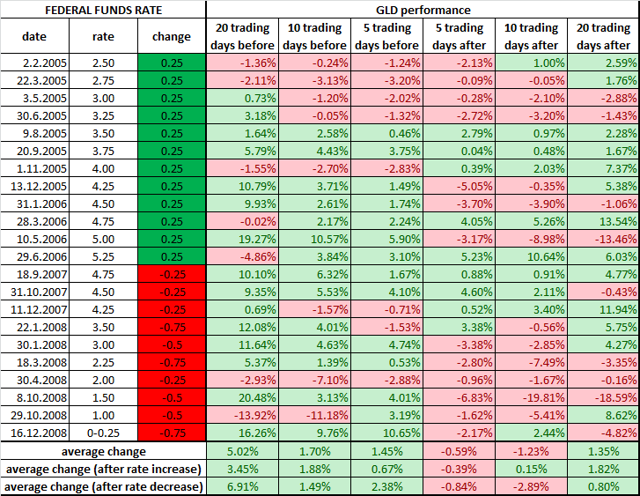 The table below shows the development of GLD share price 20, 10 and 5 trading days before the rate change and 5, 10 and 20 days after the rate change. It is interesting that on average, GLD price grew before the interest rate change and it was in a slight decline 5 and 10 trading days after the rate change. But 20 trading days after the rate change, it was back in green numbers. Only in 4 out of 12 cases (33.33%), the GLD price recorded any losses 20 trading days after the interest rate hike. It declined by 4.73% on average. On the other hand, in 66.66% of cases, the GLD price recorded gains (5.08% on average). In 4 cases (33.33%), the GLD price just kept on growing, without any reaction on the interest rate hike. After the Fed started to cut the interest rates, GLD was down in 50% of the cases after 20 trading days. After the interest rate cuts on March 18, 2008, October 8, 2008 and December 16, 2008, a strong growth trend turned into a steep decline. It shows that GLD often reacts contrary to the theory not only after interest rate hikes but also after interest rate cuts. If the Fed hikes the interest rate during its meeting on December 15/16, it doesn't mean that gold and GLD prices must crash. The official macroeconomic data don't indicate that the U.S. economy should start to overheat anytime soon; moreover, a too strong USD may hurt not only the U.S. economy. Any rate hike will be only symbolical and it will probably take a long time before another one will occur. The markets may actually welcome that the more than a year long saga is finally over, and the GLD price may react positively. As the not-so-distant history shows, it wouldn't be the first time when GLD price grows after an interest rate hike. Adding to it the problems the gold miners have to face at the current gold prices and the high demand for physical gold, GLD presents an interesting contrarian opportunity. Gold has pulled back to the 50% retracement from the pop from last week. Odds favor support will come in near 1062-1066 and will attempt to support. That's the level we need to hold. There is one final support (again short term) at 1055 but it would be better for gold to hold at 1062-1066. Resistance remains 1085-1095 and then 1102. In summary, odds favor support at 1062-1066 at the moment. Investors look to nonfarm payrolls, the fallout from Mario Draghi's stimulus plan continues, and OPEC meets to discuss the oil supply glut. Here are some of the things people in markets are talking about today. November nonfarm payrolls data is due today -- the most-anticipated piece of U.S. data to land ahead of the Fed’s Dec. 16 decision on interest rates. It would take a big surprise to derail the Fed at this point. With investor odds of liftoff when the Fed meets later this month at 74 percent, today's jobs data will probably offer more information about the pace of tightening in the months ahead than on the timing of the first hike. Economists are expecting an increase of 200,000 new jobs in the month and for the unemployment rate to hold steady at 5.0 percent. There will also be a lot of attention paid to the Average Hourly Earnings number, which jumped 2.5 percent in October. Oil spiked today from near six-year lows, as OPEC ministers gather behind closed doors in Vienna today to discuss output policy. Venezuela -- leading calls for a cut in production -- pressed the point that even Saudi Arabia is troubled about low prices, but Iran signaled it doesn’t expect OPEC to do anything to its production ceiling. Iran says it is only willing to discuss output cuts when its production reaches 4 million barrels a day, while Saudi Arabia reiterated its position that other big producers outside the group, like Russia, will have to join output curbs. Oil has slumped since Saudi Arabia led OPEC’s decision last year to maintain production and defend market share against higher-cost rivals. Gold still remains in downtrend channels on the short term. Today’s resistance points are 1063-1067 and 1072-1077 and finally 1085-1094. We need a close today above 1075 in order to turn things more bullish short term. As far as support let’s look at the medium term chart. On the medium term chart there’s lots of support lines underneath the market. Most important for the moment is 1034-1044 and then the 1023 area. There’s also support in the 950-1000 area. Here too we are still in a downtrend at the moment. The key on the medium term is for gold to re-establish itself above the 1172-1222 area and then a monthly close above 1255. That would take the medium term out of bearish mode and at least into Neutral. As long as we are below 1072-1075 on a closing basis, continue to favor lower into next week. The bottom line here is that an important low is due somewhere in the first two weeks of December and from there gold should rally into year end. That's how it looks at the moment. Gold reached 1046 on Thursday in Asia before bouncing back after the ECB announcement. That's really close to the 1034-1044 level we've been watching. It comes down to the JOBS NUMBER this morning and then we'll see. The question is whether gold made its low last Friday at the dotted line or whether gold is going to move lower to the red lines? A close above 1095 and then above 1105 would strengthen the case that an intermediate term low has been established. We have two charts to present. This rotation on the cycles chart does allow for a low to be made here and launch a rally from this point. That doesn't mean that IT WILL happen that way, but a close back above 1085 and then 1094 would indeed favor that. The one thing that this chart does emit is a BLUE cycle low, which is what BULL markets produce when they are rallying. We should bear in mind the big COT changes that have occurred in the past month as it is IMPLYING that a gold RALLY is coming. It could take a couple more weeks to develop, but we should be aware it can begin at any time. A close above 1085 will be the first thing to watch for and then a close above 1095 would be the 2nd. If we close above 1095, odds favor we are moving higher into and around the Dec 11th time frame. First things first, we need a close above 1072-1075 and then 1085. The alternate view is that there has been no inversion and the downside of gold is about to accelerate lower into Dec 7th – 11th time frame. ANY CLOSE BELOW 1150 favors this scenario. Otherwise, its possible to move higher as in the first chart. Money managers are now net short gold, reflecting an extremely bearish sentiment. ETF investors continued to sell the precious metal for a third straight week, albeit at a slower pace. Although the macro environment is negative for gold, sentiment is so weak that a reversal is likely. Net speculative positions on the COMEX as well as ETF holdings in so far as the historical economic behavior of gold prices suggests that over a short-term horizon (<3 months), gold prices are largely influenced by changes in the forward fundamentals, reflected in changes in net spec length and ETF holdings. Gold. According to the latest Commitment of Traders provided by the CFTC, money managers, viewed as a relevant proxy for speculators, became net short gold in the week ending November 17, while spot gold prices fell by almost 2 percent over the period covered by the data. The net speculative length fell from a net long position of 16,869 contracts as of November 10 to a net short position of 13,923 contracts as of November 17. In other words, the net spec length dropped 30,792 contracts from last week, the fourth consecutive weekly decrease. Taking a closer look, the fall in the net spec length was largely driven by a build-up of shorts (+29,422 contracts, the largest weekly increase since August 11) and was reinforced by a tepid liquidation of longs (-1,370 contracts, the fourth weekly decline in a row). The net spec length is now in a negative territory for the first time since August 11 and is at its lowest level since July 28. It is important to note, in our view that the net spec length is at a very low level by historical standards. Indeed, except during the summer of 2015 when money managers were net short gold for about three weeks, money managers have always been net long gold since the CFTC started to publish its statistics back in 2006. With the net spec length down 116 percent on the year and below its 2015 average (49,430 contracts) and long-term average (109,492 contracts), we argue that the spec positioning in the gold market has become overstretched to the short-side, and as such, a bout of short-covering could emerge in the very short-term. Last week I mentioned that money managers reached an extremely bearish positioning so the sell-off in gold prices could run out of steam. Although gold prices continued to reach new 2015 lows last week, we note that the market has been struggling to push sustainably lower, suggesting a waning conviction in the short side. This confirms that gold prices are close to enter a bottoming-out process. Looking ahead, I will closely monitor the current week's market action and if gold prices should manage to remain above their last week's low, this would suggest, in my view, that gold prices have already bottomed out, and I would jump in the long side accordingly although the stop loss would need to be carefully chosen due to a possible spike in volatility when prices are near a trough (or a peak). Gold. ETF investors sold gold for third week in a row as of November 20, albeit at a slower pace than the prior two weeks. Gold ETF holdings fell about 5 tonnes between November 13 and November 20, which we attribute to some selling from short-term investors ahead of the December FOMC meeting where the Fed is set to raise the federal funds rate for the first time in almost a decade. Indeed, although US macro data were not particularly encouraging such as industrial production for October (down 0.2 percent from September) or housing starts (at 1.06 million in October, down from 1.19 million in September), the release of the October FOMC minutes on November 18 proved to me more hawkish than market participants had previously envisaged. According to the minutes, most FOMC market participants anticipated that the conditions for starting the policy normalisation process could be met 'by the time of the next meeting". Against this backdrop, market participants revised upwards their expectations for the timing of the liftoff. The 30-day fed-funds futures are currently pricing in a 74-percent probability for a December liftoff, compared with 70 percent before the release of the minutes. ETF investors sold gold accordingly the following day, about 3.38 tonnes or 68 percent of the weekly amount sold. However, we believe it is worth mentioning that the pace of the decline in gold ETF holdings has slowed, which suggests that those holdings are increasingly held by stronger hands. In spite a downward trend in ETF holdings since late 2012, the pace of outflows has gradually declined. Amounting to 1,518 tonnes as of November 20, total gold ETF holdings (tracked by FastMarkets) were down 5 tonnes from last week and 33 tonnes from the start of November. They are therefore on track to record the first monthly outflow in 4 months as investors were net buyers of 12 tonnes of gold in October, 2 tonnes in September and 10 tonnes in August. ETF investors are currently net sellers of 77 tonnes of gold on the year, due to strong outflows between March and July. Looking ahead, we believe that the current commodity-unfriendly macro environment could push gold ETF holdings below their year-to-date low of 1,517 tonnes seen early in August. However, we do not expect the pace of ETF selling to accelerate nor these holdings to fall sharply below the 1,500-tonne level in so far as those physical holdings are held by "strong hands" investors with a long-term philosophy. From a technical perspective, it is clear to me that the market is deeply oversold in the near-term and as such, a rally is necessary to alleviate deeply oversold conditions. Further, GLD is sitting near a solid support, the 98-100 level, which could thereby induce some short-covering from this price level. From a fundamental perspective, sentiment is currently so weak that a reversal in gold prices appear to me very likely at this crucial juncture. From a short term perspective, we have the Thanksgiving Holiday in USA upon us and markets this is a time when we can see very little change in price for the remainder of the week. But it is also a point where the control boyz can move the market (because of low volume participation) in a sharp manner in either direction if they so choose. In the past we have seen it all. We have seen 50 dollar rallies on the Friday after Thanksgiving, we have seen big sell-offs and we have seen this holiday produce almost no price movement. Thus it is impossible to gauge exactly what will transpire this time. While the above article strongly argues a rally is fast coming, there is nothing to say that it can't take another week or two to fully develop. The other factor that is key to remember is the FOMC meeting coming up in December. The FED is quickly running out of reliability as they have cancelled a raise in rates over and over. With the global economic situation imploding, they are in quite the pickle at the moment. In fact they even called an emergency meeting for last Monday. Here is what was listed on the Fed Website in regards to that meeting; My thanks to Greg L. for the notification. 1. Review and determination by the Board of Governors of the advance and discount rates to be charged by the Federal Reserve Banks. Since that meeting, there has been no further announcements. Thus we are not sure if they have decided not to raise rates or whether they push forward. As far as the short term gold chart, prices have continued to vacillate in a very tight range over the past week between 1067 and 1084. We need a close above 1085 to neutralize the situation and then a close above 1095 -1102 in order to favor higher prices towards either 1112-1115 and or 1122-1127. As long as we remain below 1085 the potential to move lower can continue. The short term gold cycles are also reflecting the uncertainty in the market. Today, we have two charts to present. The first chart is suggesting that gold remains very weak and that a final selloff into and around Dec 7th is going to take place. If this scenario develops, we would look for the low of the year to be established then and a reaction rally to take place going into the Jan-Feb time frame. While this looks to be the preferred chart rotation of the short term cycles, let's look at one more chart. This alternate chart does allow for a low to be made here and launch a rally from this point. One of the reasons we are less inclined to believe this chart is correct is that Martin Armstrong has a potential bear market low reading during the week of December 7th. That doesn't mean that IT WILL happen that way, but it does make us hesitate here to say the chart below has a better chance to be correct. The one thing that this chart does emit is a BLUE cycle low, which is what BULL markets produce when they are rallying. In summary, the cycles are reflecting what the current market conditions are, and that is uncertainty. With that said, we should bear in mind the big COT changes that have occurred in the past month as it is IMPLYING that a gold RALLY is coming. It could take a couple more weeks to develop, but we should be aware it can begin at any time. A close above 1085 will be the first thing to watch for and then a close above 1095 would be the 2nd. If we close above 1095, odds favor we are moving higher into and around the Dec 7th time frame. In conclusion, there is no confirmation yet that gold can't go lower, but there are many signs that the bear market is in its final chapter from the 2011 high. Our last update discussed that the short term cycle window was closed but the weakness in gold was still suspect. Since then new lows have been made and the Thanksgiving Holiday and next cycle turn of Nov 25th is right in line with the holiday week. A move higher to next week will suggest that gold will move lower after that into the week of Dec 7th where an IMPORTANT LARGER CYCLE exists that could …..and I say “could’ provide the gold low. The other longer term cycle would be March 2016 (and still the preferred cycle turn). We have closed daily below the 1072 key reversal point this week but THE FRIDAY CLOSE WILL BE THE MOST IMPORTANT. A close below 1072 will favor a low to be put in place next week. Then a short term bounce back towards 1105-1125 should be in order. However, IF WE CLOSE ABOVE 1088 today, then it’s possible we can still head for a high next week near 1095-1112. Odds favor a bounce back to develop from here but we must first close above 1085 and then 1095 in order to get more confirmation that the cycle turn is in play. The potential for lower prices in December towards 1030-1050 will be in play on a Friday close below 1072. Gold remains weak and needs a close above 1094-1095 to relieve short term pressure. It is trying to hold the 1072-1080 area on the weekly close. We closed below 1072 on Wednesday, but it is possible (like we said on Twitter last night) that gold was making the lows for the week. Odds favor a test of 1088-1095 is taking place and then we will see if gold wants to move higher. Support will be 1072-1076 going into Friday Morning. A close below 1072 keeps things bearish on Friday. The short term cycle window is open until this Friday and it looks like gold is making a short term low here today or tomorrow. We have retested the 1072 bear market low and a short term bounce back towards 1105-1125 should be in order. Odds favor a bounce back to develop from here. The potential for lower prices in December towards 1030-1050 or any close below 1072 will come in play. It looks like gold is making an attempt to reverse the downtrend here as we have re-tested the July low near 1072. Today’s low at 1073 qualifies as a re-test. From here, odds favor that gold reverses higher into the end of November towards 1105—1112 or 1120-1130. Short term resistance is the blue and red moving averages. We need above 1094 to favor a short term low is in place. We got our low near 1131 last week and so far this week, we’ve moved to the final uptrend line where gold must either hold or the 1100 area at the Fib 78& retrace will be next. We’re moving into the ADP report on Wednesday and the NFP report on Friday. If gold is going to turn up, it has to happen at one of these two areas. If gold can recapture 1122 it will give it a potential to get to around 1148-1150. If the blue cycle turns here, ok, but even then, it looks like it could just be a bounce. On the other hand, if gold has resumed a bull market (and that’s no where near CONFIRMED by any means) then it should turn here. It’s very possible that the 1122 area will be where gold is come Friday’s NFP report and the results will most likely propel the next move. If I had to pick one, I’d favor a bounce into next week.